So I just discovered the secret of the sock bun from my friends at Sweetspot and iVillage and I am obsessed! How did I never know about this?! Have any of you? I think it might change my bun-sporting life. 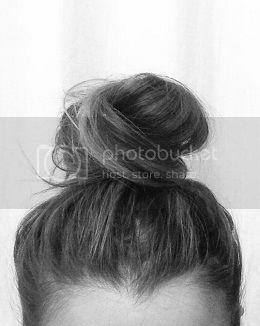 In two minutes flat, you can create a full - dare I say 'plump' bun that's perfect for an elegant affair or even just a hot summer day. Colour me insanely happy. i want to give this a whirl! looks fabulous and easy enought. I just discovered this too, its amazing!! I love this photo!! I am hosting an instragram link up on Monday and would love if you could participate!!! xxoo! I've heard about it but haven't tried it yet! Think it's about time I do!